Shri Nitin Gadkari, Former All India President of Bharatiya Janata Party, and at present an Important Minister in Union Cabinet, is regarded as one of possible successors to Shri Narendra Modi, when a need is likely to arise. He is not a persona non grata. Hence, what he says and how he acts, are all very important. Recently, he is in news, albeit for somewhat awkward reasons, through his Comments about the present predicament of Shri Vijay Mallya , the former Owner of Kingfisher Airlines and United Breweries. Later, Shri Gadkari clarified that Media misquoted him. Hence, there is a need to analyse some quotes which are attributed to him. Nitin Gadkari ‏Verified account @nitin_gadkari There is a clear difference between business cycle downturns and financial fraud. My statement is about support during downturns to protect jobs. FRAUD is completely UNACCEPTABLE. 11:16 PM - 13 Dec 2018 . Between `business downturns` and `frauds`, there may be 10 more other situations. E.g. mismanagement, reckless-spending, diversion of funds, Investments abroad in exchange for golden visas, Donations in exchange for Rajya Sabha Seats. (Context: Mr. Gadkari's Speech at an Economic Summit organised by Times Group): -- It is unfair to tag a one-time loan defaulter Vijay Mallyaji as a chor (thief). The embattled businessman has a four-decade-long track record of timely debt servicing. I am writing this, not only in respect of Corporates owned by Mr. Vijay Mallya. It applies to all Business and Industrial Corporates in India and abroad. Corporate Loans once taken will never get repaid. There will only be `Renewal of Limits` every year, by obtaining Financial Statements and Calculating Ratios. When enhancement of limits takes place, the Enhanced amount will take care of repayments made by the Corporates. In other words, Corporates can borrow funds elsewhere, repay instalments/regularise Cash Credit Accounts, and get their limits enhanced. Later they can draw from their New Enhanced Limits, and repay the borrowings made from outside. I have no business dealing with Vijay Mallya, who faces extradition from the UK for alleged bank fraud and money laundering amounting to an estimated Rs. 9,000 crore. Then, why this sympathy for Mallya who fled the country with 300 suit cases for a World Sports Meet? Does he (our Hon. Minister) have more Corporate friends who have committed frauds with Bank funds, and who want to hide behind `Business Downturns`? 40 saal Mallya regular payment kar raha tha, byaaj bhar raha tha. 40 saal baad jab wo aviation mein gaya....uske baad wo adchan mein aaya to woh ekdum chor ho gaya?...jo pachaas saal byaaj bharta hai wo theek hai, par ek baar wo default ho gaya...toh turant sab fraud ho gaya? Ye mansikta theek nahi hai. (For 40 years Mallya was regularly paying interest on loans. After entering the aviation sector, he started facing problems, and suddenly he became a thief? If a person repays the interest for 50 years, and if he defaults once, then suddenly everything is fraud? This mindset is not correct. As explained above, these Repayments are notional, in the sense that even if credits appear in the loan account, they are funds borrowed from elsewhere, or from the same Bank, in a different Limit, or in a different Loan account from a Group Company / Sister Company. The loan I am referring to was from the Maharashtra government-owned entity Sicom to Vijay Mallya, extended 40 years ago, which he repaid on time without any default. This is a sort of Kite flying indulged by most Corporates worldwide. Get loans/investments from X, and pay Y. Borrow more from Y and pay Z. There are 26 letters in English language. Ups and downs are part and parcel of any business. If someone goes through a downward cycle, then he or she has to be supported. To take care of these ups and downs only, big Corporates have to control their debt leverage (Ratio between Debt and Capital brought in by Promoters). If debt is high, and Capital is low, Risk by compulsion passes on to Creditors. Public Sector Banks which depend on Trust of people, mobilise their funds mostly as medium and short term Deposits repayable between 1 and 5 years. Hence, Public Sector Banks should not be expected to lend to High Risk Ventures. There are risks in the business, be it banking or insurance, there are ups and downs. But, if the mistakes are bona fide, because of global or internal factors in the economy like a recession, then that person who is facing difficulties must be given support. Private Sector Banks and Private Sector Business persons are supposed to be Super-Efficient like Tarzans and Hercules-es, while Public Sector Executives are taken as duds. Then why don't the Private Sector Banks and Private Sector Corporates shoulder the Risks, when their Executives and Promoters are paid more than President, Prime Minister, and CJI of India? When there are profits, the Corporates draw funds by declaring astronomical dividends, issue for themselves bonus shares which they may sell at high premium. But, when there are losses, why do they want Public Sector Banks to shoulder them? An election loss is similar to a business failure. I lost an election when I was all of 26. But that the loss did not mean that my political career ended. Those who have the wherewithal to spend millions in Elections repeatedly in spite of successive defeats, can continue in Politics for several Elections. Besides, they can recoup their Capital through quid pro quos and kickbacks during the periods when they occupy seats of power. For them, money lost, is not MONEY LOST FOR EVER. Hence, Election Cycles will be different from Business Downturns. On the other hand, if an honest middle class person contests elections, after one election whether he-she loses or wins, he will not have funds for the second election. Funds cannot be mobilised for series of Elections. There is need for a more considerate and realistic approach to NPAs. Our banking system is such that it does not support sick companies. Here, a distinction should be made between Public Sector Banks and Private Sector Banks. Private Sector Banks can attract funds from Rich Corporates, and High NW Individuals. Mr. Gadkari can ask the Private Banks to support sick Companies. When Public Sector Banks suffer losses owing to bad Corporate NPAs, the ultimate burden falls on poor and lower middle class depositors, for no fault of their own. If Government releases funds from Budgets, the burden will fall on Nation's Tax payers, for no fault of their own. Business Downturns or Frauds or Mismanagement, or whatever else the reasons may be, those who enjoy Corporate Dividends should bear the losses and insolvencies. India is a country of Very Poor People. The System of Limited Companies (Companies which are incorporated with Limited Liability-- in other words its shareholders liability will be limited only to their share subscriptions) prevalent abroad is not suitable for India. Sometimes, Lending Banks obtain personal guarantees from Promoters of Borrowing Companies, and get mortgages of immovable Properties owned by promoters. While that precaution is good, Company Law will have to be amended removing Pvt-Ltd., and Public-Ltd Company System, and introduce Joint and Several UNLIMITED Liability System similar to that in force for Sole Trading and Partnership Firms. Public Sector Banks mobilise their deposits from Lower Middle and, Middle Class Persons from our Villages, small Towns, Small Cities, and of course Metro Cities. If Public Sector Banks accumulate losses by financing Corporates recklessly, they will lose their liquidity and solvency, and the interests of poor lower middle class, and Middle Class depositors will fall in jeopardy. When someone is serious then we put him/her in an ICU. But our banking system first puts a sick company in the ICU and then ensures that it dies. Not factual. There are numerous instances of Public Sector Banks supporting incipient-sick and deep-sick Companies. Probably, this is the first time, a Public Sector Bank dared to declare a High Profile Business man as a defaulter! (This courage was not shown in respect of Dabhol Power Project, which closed down). Given a choice I shall prefer dishonest people who makes mistakes than the honest who do not want to take decisions. 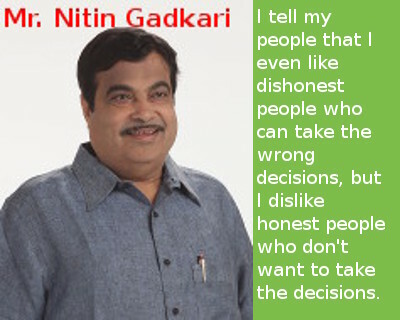 This seems to be a subjective opinion of Mr. Gadkari. Dishonest people may also delay / refuse to take decisions till they get their kickbacks. They may act like a Supersonic Jet, when the kickback is received in advance. Decisions of honest Executives do not depend on "speed". They depend on protecting the Interests of their Organisations. Mr. Gadkari has great Reputation that in his National Highways Ministry, Contracts proposed at 10 a.m. are approved at 1.00 p.m. on the same day. Only time will tell , how many of his Ministry's Decisions which are publicised to take place without his intervention through E Contracts, are going to be mistake-free, how many are going to be partial failures, and how many are going to be total failures. National Highway Authority of India signed an agreement with the State Bank of India (SBI) for a long-term unsecured loan to the tune of Rs 25,000 crore. Infrastructure Leasing & Financial Services (IL&FS) group Companies have invited bids to sell 36 luxury cars, including brands like Audi, BMW, Jaguar, Mercedes Benz, Land Rover, Honda, Toyota, and Skoda. I hope SBI will not trod a similar path. We need not worry as long as SBI lends only to NHAI, and not its Private Sector Partners. Security of assets like Partly finished Road Construction Work, metal chips, probably some bitumen-spreading machines would have been irrelevant. They can't be sold. Hence, Unsecured Loan is appropriate, for SBI to lend. I don't have the knowledge and science required (for these projects), but I am a dare-devil. We cannot be dare-devils with public funds, or SBI public moneys. We can be dare devils in respect of our own personal moolahs and the bucks of our family Companies such as Sugar factories. Definitely not with People's present and future. I tell my people that I even like dishonest people who can take the wrong decisions, but I dislike honest people who don't want to take the decisions. A dishonest man, once he gets his bribe, may not hesitate to revive a dead tiger to life. But an honest person will never do it. When he sees a dishonest person bringing a tiger back to life, the honest person will have no alternative except to climb a tree. I only do what convinces my conscience, I don't fear anyone. It will also be better to depend on counsel from a Committee of Honest persons. If dishonest persons are COMPULSORILY REQUIRED on the Committee for quick decisions, I request Shri Gadkariji to have a Committee of 2:3 (dishonest:honest persons ratio) Ratio.